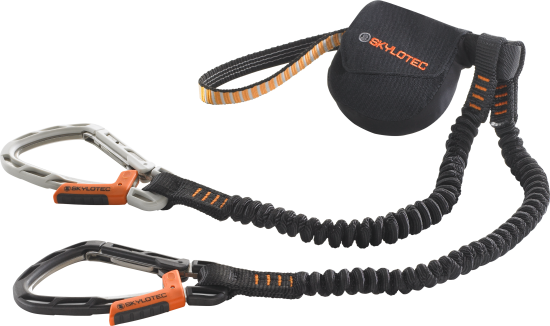 The brand SKYLOTEC stands for the highest safety in industry and mountain sport. In the critical area of via ferrata sets in particular, we aim to have the “safest via ferrata set on the market” since we launched the “RIDER”. Our quality controls are accordingly stringent. 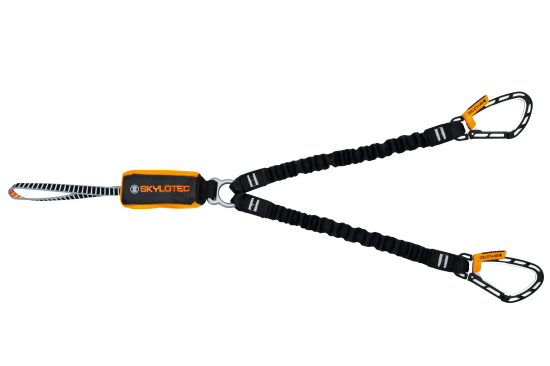 During the routine quality check of the last batch of the SKYSAFE carabiner, we noticed that its break values are scattered, even though the hardness tests exhibited no deviations. During an enhanced sampling, erratic values were even determined in a range that is no longer standard-compliant/safety-relevant. The cause for this has now been identified and is due to the hardening process of the steel body. Since we cannot fully rule out that older batches are affected by the quality defect based on the erratic values identified, we have decided to collect all SKYSAFE carabiners from the market for an internal inspection. We are doing this in order to meet our claim of meeting the highest safety and quality standards. Please feel free to contact us with any questions you might have. We are here for you. Here you can find the answers to frequently asked questions regarding our call for inspection check. Please feel free to contact us with any questions you might have. We are here for you. Which sets are affected by the carabiner check? We are checking the carabiners for the following products. This applies to all batch and serial numbers for the via ferrata sets listed below. 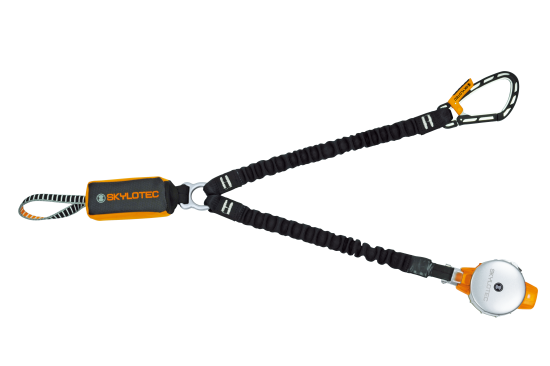 SKYLOTEC will upgrade the energy absorbing lanyards for the following products made in 2017. All other years of construction are not affected. How do I send in my via ferrata set? Please send an email to [email protected] including your collection address, telephone number, number of packages and weight of the packages. We will then arrange for your goods to be collected free of charge and will send you confirmation. Please make sure you enclose our return form with your shipment. Please use the return form for direct shipment to us. In order to make it fast and convenient for you to send your products back, you can create your GLS returns label here for free shipment. The costs of shipment via a different parcel service cannot be covered. You can send in your via ferrata set through the dealer, where you originally purchased your via ferrata set. 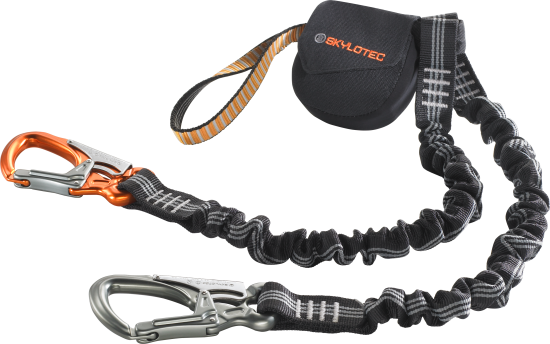 Bring your via ferrata set and your proof of purchase to your dealer, who will then take care of the shipment. Please contact Bacol AG, our partner in Switzerland to organise the shipment. Please enclose our return form with your shipment. How long will the replacement action last? When will I get my set(s) back? The inspection of via ferrata sets takes approx. 10 working days. Custom regulations specific to each country may result in delivery delays. 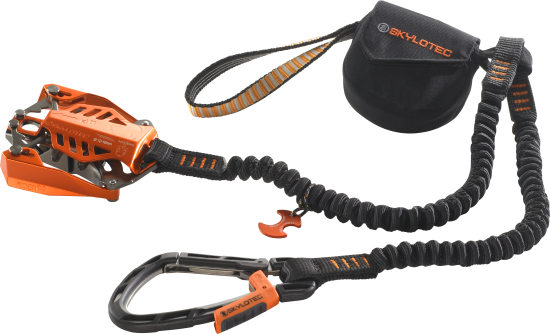 Is it possible to return a via ferrata set? No returns are possible for any via ferrata sets. Why must the carabiner be checked? During the ongoing routine checks of the latest batch of SKYSAFE carabiners, we noticed extreme scattering of the break values. This is caused by the manufacturing process of the steel body. 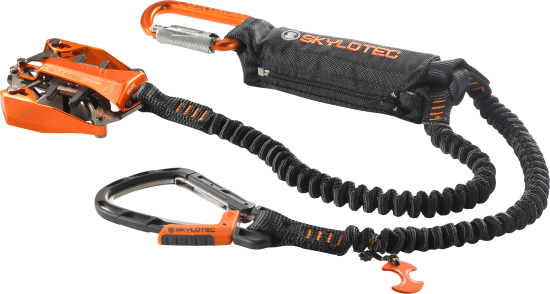 As we cannot rule out that older batches are affected by this production defect as well, we decided to ask for all SKYSAFE carabiners in the market to be returned for an internal check. We will use a new test method from aerospace technology for the check, using which every carabiner can be checked and evaluated unambiguously in a non-destructive manner. After the set is registered at Goods Receipt, it is transferred to Quality Control. There, the carabiners are checked. If the carabiners are OK, they are marked accordingly and the via ferrata set is subjected to a PPE (personal protective equipment) test. If everything is OK, the set is directly returned to its owner in perfect technical condition. If the test results in carabiners to be replaced, the via ferrata set is reworked. After carabiner replacement, the set is subjected to the PPE test again and returned to its owner in perfect technical condition. How does the PPE test work? The PPE test (PPE – personal protective equipment) is performed by an expert in accordance with DGUV 312-906. 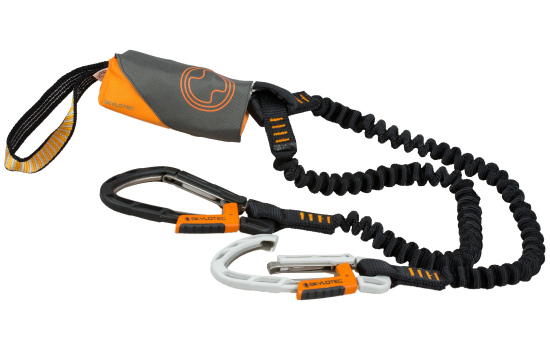 For this purpose, all components of the set (carabiners, seams, flexible arms, etc.) are subjected to an optical and haptic check in accordance with the test specifications. If all components and seams are OK, the set is handed over to Shipping. 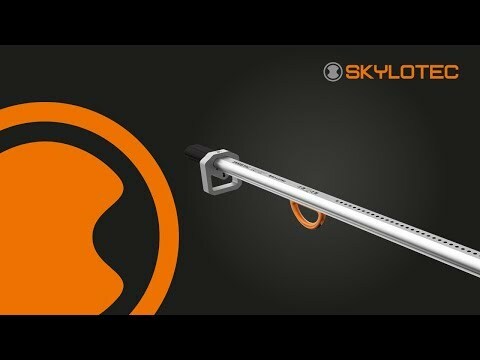 If parts must be replaced, SKYLOTEC will contact the owner of the respective set. Which sets are upgraded with energy absorber? We upgrade all sets with energy absorber, which were produced in accordance with the updated EN 958:2017. 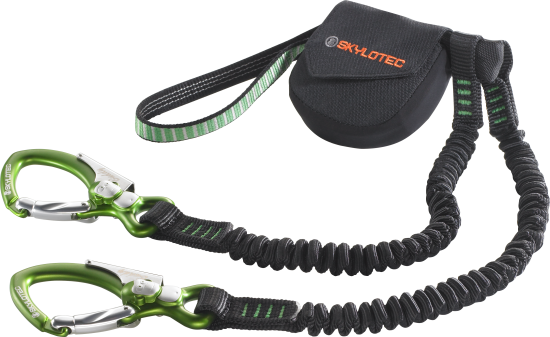 RIDER 3.0 and SKYSAFE III models are upgraded with energy absorber in addition to the carabiner check. For SKYSAFE SAM and SKYSAFE DURO models, we offer the upgrade as additional service free of charge. How has the energy absorber been optimised? The safety of the user and the durability of our products are a top priority for us – and so we continuously work on further developing our products and components. We have raised the static response force of the energy absorber slightly so that the breakaway torque matches adequate force application. This ensures that the energy absorber is not released too soon and will therefore not have to be replaced prematurely. What is the static response force? The static response force is defined as the force required to trigger the energy absorber. Standard EN 958:2017 specifies it as > 1.3 kN. If the force is too low, the energy absorber may be triggered without a fall load (e.g., during resting). If it is too high, the energy absorber may not trigger or trigger too late. What is the breakaway torque? The breakaway torque describes the moment at which the established static response force is exceeded and the energy absorber starts to open and absorb the input of energy (fall). How can I tell if my set has been checked? 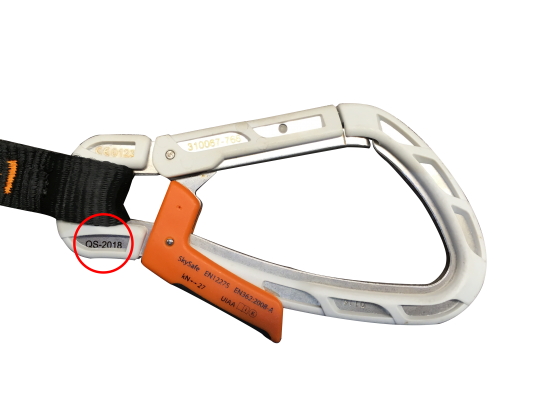 You will see a laser marking on the carabiner (QS-2018).